Adolph Abramovich Joffe (Russian: Адо́льф Абра́мович Ио́ффе, alternative transliterations Adolf Ioffe or, rarely, Yoffe) (10 October 1883, Simferopol – 16 November 1927, Moscow) was a Communist revolutionary, a Bolshevik politician and a Soviet diplomat of Karaite descent. Adolf Abramovich Joffe was born in Simferopol, Crimea, Russian Empire in a wealthy Karaite Jewish family. He became a social democrat in 1900 while still in high school, formally joining the Russian Social Democratic Labor Party in 1903. In 1904 Joffe was sent to Baku, which he had to flee to avoid arrest. He was then sent to Moscow, but had to flee again, this time abroad. After the events of Bloody Sunday on January 9, 1905, Joffe returned to Russia and took an active part in the Russian Revolution of 1905. In early 1906 he was forced to emigrate and lived in Berlin until his expulsion from Germany in May 1906. In Russia, Joffe was close to the Menshevik faction within the Russian Social Democratic Party. However, after moving to Vienna in May 1906, he became close to Leon Trotsky's position and helped Trotsky edit Pravda from 1908 to 1912 while studying medicine and with Alfred Adler, psychoanalysis. He also used his family's fortune to support Pravda financially. During the course of his underground revolutionary activity Joffe adopted the party name "V. Krymsky," the surname meaning "The Crimean." In 1917, Joffe, freed from the Siberian exile by the February Revolution, returned to the Crimea. Crimean social democrats sent him to the capital, Petrograd, to represent them, but he soon moved to an internationalist revolutionary position, which made it impossible for him to remain in an organization dominated by less radical Mensheviks. Instead, he joined forces with Trotsky, who had just returned from abroad. In May 1917, Joffe and Trotsky temporarily joined Mezhraiontsy who merged with the Bolsheviks at the VIth Bolshevik Party Congress held between 26 July (all dates are Old Style until February 1918) and 3 August 1917. At the Congress, Joffe was elected a candidate (non-voting) member of the Central Committee, but two days later, on August 5, the Central Committee, some of whose members were in prison, in hiding or lived far from Petrograd and couldn't attend its meetings, made Joffe a member of its permanent ("narrow") bureau. On August 6, Joffe was made an alternate member of the Central Committee Secretariat and on August 20 made a member of the editorial board of the Bolshevik newspaper Pravda which was then temporarily called Proletary (Proletarian) for legal reasons. Joffe headed the Bolshevik faction in the Petrograd Duma (city government) in the fall of 1917 and was one of the Duma's delegates to the Democratic Conference between September 14 and 22. Although Joffe, along with Lenin and Trotsky, opposed the Bolsheviks' participation in the consultative Pre-parliament created by the Democratic Conference, the motion was carried by the majority of Bolshevik deputies at the Democratic Conference and Joffe was made a Bolshevik member of the Pre-parliament. Two weeks later, on October 7, once the more radical Bolshevik faction gained the upper hand, Joffe and other Bolsheviks walked out of the Pre-parliament. In October 1917, Joffe supported Lenin's and Trotsky's revolutionary position against Grigory Zinoviev's and Lev Kamenev's more moderate position, demanding that the latter be expelled from the Central Committee after an apparent breach of party discipline. 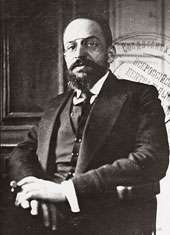 Joffe served as the Chairman of the Petrograd Military Revolutionary Committee which overthrew the Russian Provisional Government on October 25–26, 1917. Immediately after the revolution, he supported Lenin and Trotsky against Zinoviev, Kamenev, Alexei Rykov and other Bolshevik Central Committee members who would have shared power with other socialist parties. Although Joffe had signed a ceasefire agreement with the Central Powers on December 2, 1917, he supported Trotsky in the latter's refusal to sign a permanent peace treaty in February. [lower-alpha 1] Once the Bolshevik Central Committee decided to sign the Treaty of Brest-Litovsk on February 23, 1918, Joffe remained a member of the Soviet delegation only under protest and in a purely consultative capacity. Grigori Yakovlovich Sokolnikov, leader of the signatory team, signed on behalf of Russia. At the VIIth Extraordinary Congress of the Bolshevik Party between March 6 and March 8, 1918, Joffe was re-elected to the Central Committee, but only as a candidate (non-voting) member. He remained in Petrograd when the Soviet government moved to Moscow later in March and worked as a member of the Petrograd Bureau of the Central Committee until he was appointed Soviet representative to Germany in April. 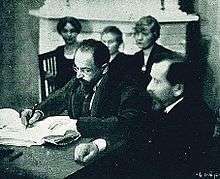 He signed the Soviet-German Supplementary Treaty on August 27, 1918. On November 6, 1918, literally days before the Armistice and the German Revolution, the Soviet delegation in Berlin headed by Joffe was expelled from the country on charges of preparing a Communist uprising in Germany. In 1919–1920, Joffe was a member of the Council of Labor and Defense and People's Commissar (minister) of State Control of the Ukrainian Soviet Republic. He wasn't re-elected to the Central Committee at the VIII Party Congress in March 1919 and would never again occupy a major leadership position. He negotiated a ceasefire with Poland in October 1920 and peace treaties with Estonia, Latvia and Lithuania in late 1920. In 1921 he signed the Peace of Riga with Poland ending the Polish-Soviet War and was made deputy chairman of the Turkestan Commission of the VTsIK and Sovnarkom. Joffe was one of the Soviet delegates at the Genoa Conference in February 1922, an experience he described in a short book published later that same year. After the Soviet walkout, he was made ambassador to China, as the Soviet troubleshooter (or Kuznetsov) of those days. In 1923, Joffe signed an agreement with Sun Yat-Sen in Shanghai on aid to Kuomintang on the assumption that the latter would cooperate with Chinese Communists, presumably with Lenin's approval. While in China, Joffe traveled to Japan in June 1923 to settle Soviet-Japanese relations. The negotiations proved long and difficult and were aborted when Joffe became gravely ill and had to be sent back to Moscow. After a partial recovery, he served as a member of the Soviet delegation to Great Britain in 1924 and as Soviet representative in Austria in 1924–1926. In 1926 his declining health and disagreements with the ruling Bolshevik faction forced his semi-retirement. He tried to concentrate on teaching, but it also proved difficult due to his illness. Joffe remained a friend and loyal supporter of Leon Trotsky through the 1920s, joining him in the Left Opposition. By late 1927, he was gravely ill, in extreme pain and confined to his bed. After a refusal by the Stalinist leadership of the Communist Party to send him abroad for treatment and Trotsky's expulsion from the Communist Party on November 12, 1927, he committed suicide. He left a farewell letter addressed to Trotsky, but the letter was seized by Soviet secret police agents and later selectively quoted by Stalinists to discredit both Joffe and Trotsky. Trotsky's eulogy at Joffe's funeral was his last public speech in the Soviet Union. Joffe's wife Maria Joffe was arrested as a left-oppositionist Trotskyist by Stalin's security forces, yet she survived to write her memoirs One Long Night - A Tale of Truth. Joffe's daughter, Nadezhda Joffe, also an active Trotskyist, survived Stalin's prisons and labor camps and published a memoir, Back in Time: My Life, My Fate, My Epoch. ↑ Trotsky, People's Commissar for Foreign Affairs, appointed Joffe to lead the negotiation team, but Trotsky resigned his post prior to the signing of the Treaty of Brest-Litovsk. ↑ See Albert S. Lindemann. Esau's Tears: Modern Anti-Semitism and the Rise of the Jews, Cambridge University Press, 1997; pg. 430. ↑ Ambassadors of the Soviet Union to Germany: Adolph Joffe, Vladimir Dekanozov, Nikolai Krestinsky, Konstantin Yurenev, Voldemar Aussem, LLC Books, 2010. ↑ See Chapter XVII of Leon Trotsky's 'My Life' Archived March 5, 2006, at the Wayback Machine. ↑ Nadezhda A. Joffe, Back in Time: My Life, My Fate, My Epoch: The Memoirs of Nadezhda A. Joffe. Frederick S. Choate, trans. Oak Park, MI: Labor Publications, 1995; pg. 3. ↑ Quoted in Arno J. Mayer. Political Origins of the New Diplomacy, 1917-1918, Yale Historical Publications, Studies 18, 1959. Reprinted as Wilson vs. Lenin : Political Origins of the New Diplomacy, 1917-1918, Cleveland, World Pub. Co., 1964; pg. ??? ↑ A.A. Ioffe (V. Krymskii), Genuezskaia Konferentsiia (The Genoa Conference). Moscow: Krasnaia Nov', 1922. ↑ For a Trotskyist perspective on the impact of Joffe's visit on the Japanese Communist Party, see The Meiji Restoration: A Bourgeois Non-Democratic Revolution published in Spartacist, English edition, No. 58 for 2004. Joffe, Maria: One Long Night: A Tale of Truth. London: 1978. Joffe, Nadezhda: Back in Time: My Life, My Fate, My Epoch. Frederic S. Choate, trans. Oak Park, MI: Labor Publications, 1995. Volobuev, Pavel Vasil'evich (ed. ), Политические деятели России 1917: Биографический словарь. (Russian Politicians, 1917: A Biographical Dictionary). Moscow, Bol'shaia Rossiiskaia Entsiklopediia, 1993. Zalesskii, Konstantin Aleksandrovich, Империя Сталина. Биографический энциклопедический словарь (Stalin's Empire: A Biographical Encyclopedic Dictionary). Moscow, Veche, 2000. Wikimedia Commons has media related to Adolf Joffe.